If you didn’t already know what filmmaker Spike Lee (DO THE RIGHT THING) thinks of Donald Trump and the current state of race relations in the US then you don’t need to look any further than his latest film, BLACKKKLANSMAN, to figure it out. Lee doesn’t pull any punches here, unfortunately to the film’s detriment. 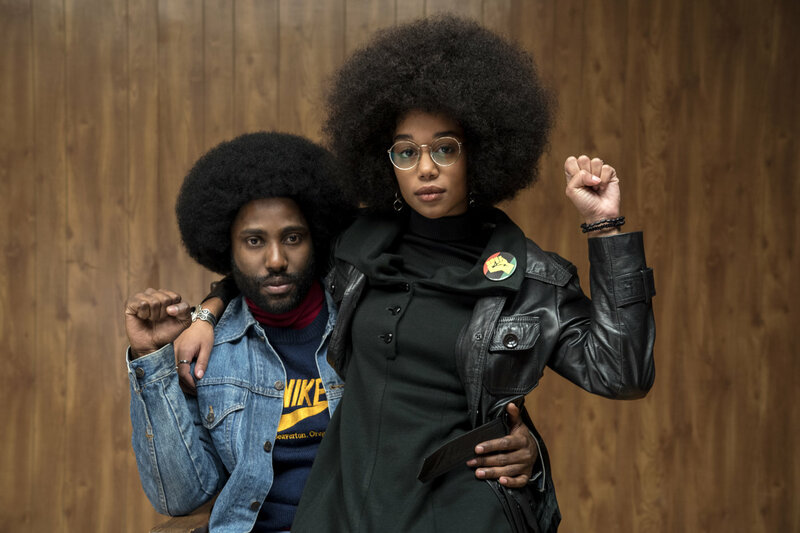 BLACKKKLANSMAN tells the true story of rookie detective Ron Stallworth (John David Washington, Denzel’s son), who, in 1972, becomes the first African-American on the Colorado Springs, Colorado police force. This is a time when racism is the norm both outside the police department and in, and when young African-Americans are starting to assert their constitutional rights as equal citizens of the United States with people like Martin Luther King Jr., Malcolm X, Stokely Carmichael (later Kwame Ture) and others leading the movement for change… movements, really, as King on one side and Malcolm X and Carmichael on the other had/have differing visions on how that change would occur. Stallworth isn’t content simply being the poster child for institutional integration though; he wants to make a difference. With the help of his colleague, Flip Zimmerman (Adam Driver, STAR WARS: THE LAST JEDI; LOGAN LUCKY; PATERSON; SILENCE; STAR WARS: THE FORCE AWAKENS; WHILE WE’RE YOUNG; INSIDE LLEWYN DAVIS; FRANCES HA), he infiltrates the Ku Klux Klan just as the white supremacist organisation is moving toward the mainstream. The film is being billed as a crime-comedy but there is very little to laugh about as the parallels between then and now are blatantly obvious. Yes, we can chuckle at the scenes where Ron puts on a “white” accent or when he makes a fool (multiple times) of KKK Grand Wizard David Duke (Topher Grace, TV’s THAT ’70S SHOW) without Duke realising it, but throughout most of the film it’s fairly serious fare as the two detectives hang out with some trigger-happy good ol’ boys or, as Trump calls them, “very fine people”, who would kill them in a half a second if they knew who they really were. In his biggest role to date, Washington shows that he’s up to the challenge. I remember seeing Denzel Washington on a talk show years ago saying that his son didn’t want to be an actor, preferring instead to focus on a career playing professional football. While John doesn’t have the depth that his father had at that age (I was a Denzel fan right from his TV days on ST. ELSEWHERE), he is both enjoyable and believable to watch. Love his Soul Train afro too! Interestingly, Denzel starred in one of Spike Lee’s first features, MO’ BETTER BLUES, in 1990. Both father and son were also in Lee’s 1992 film, MALCOLM X. Also worth watching is Laura Harrier (SPIDER-MAN: HOMECOMING), who plays Patrice, Ron’s social activist/love interest. She looks like a young Lisa Bonet here. As solid as the performances are, Lee plays it heavy-handed with the film’s message that little has changed in America in 46 years, where what was old is new again… or maybe it did change but then the clock started to turn back with the political ascendancy of one Donald J. Trump. The final five minutes of the film flashes forward to 2017 where white supremacists and counter-protesters clashed in the streets of Charlottesville, Virginia, leaving one woman dead as the result of a car ramming. Poignant though these images are, their inclusion as the film’s epilogue unfortunately serve to detract from what is an amazing and generally true story. I’d really be surprised if this film will make it to more than a handful of cinemas south of the Mason-Dixon Line where it needs to play, but perhaps Lee already knows that it’s an unlikely scenario regardless of how the film ends. If there’s anything positive one can say about the ending, it’s that Lee clearly has enough clout in Hollywood that he can have it his way. It’s unlikely that BLACKKKLANSMAN will come to our cinemas in Hong Kong as it just won’t appeal to mainstream local audiences for reasons that are best left unsaid. Fortunately, as I like to say, we have options these days and many of them are legal. The film is available now on Amazon Prime and starting on December 17 on iTunes. Even with its bleak ending, BLACKKKLANSMAN is still well worth seeing. Watch the review recorded on Facebook Live on Thursday, November 29th at 8:30 am HK time!